"Its neat, but they really need a better computer. The reason why it clicks over and over is because the screen is laggy. The screen keeps pausing because they are running the software for the 'robot' on the same computer as the game. While the robot is making its millions of calculations on trajectory, the game lags out for a moment. When the ball stops, the robot lets off the button as the ball is no longer moving(the robot only moves its piece when the ball moves towards it). They need to update their technology or get a second laptop." "If a clip of R2D2 and Chewbacca playing Dejarik doesn't appear here soon I will assume the Internet is broken. Actually I tried to find such a clip now and couldn't. The implications are staggering." "Yossi - actually, this doesn't surprise me. 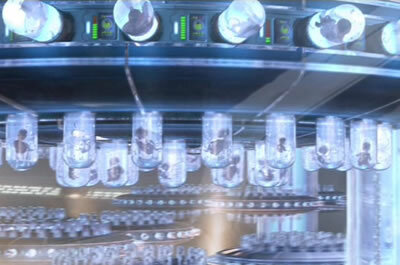 Take a look at this secret photo depicting the preparation of the Lucasfilm lawyer clone army. "Brandon - I was wondering about that. Do you have some background in robotics?" "Naw, but I do have background in programming. It should be super simple for the robot to track the object and yet it has to click over and over. I studied the video and noticed the clicks coincide with the computer screen pausing. Yet when the ball goes back towards the user side of the board, its smooth. That means the robot isn't doing any difficult calculations during that time."